Giancarlo Stanton taking batting practice with Yankee Stadium ready for Opening Day. All photos by Jason Schott. 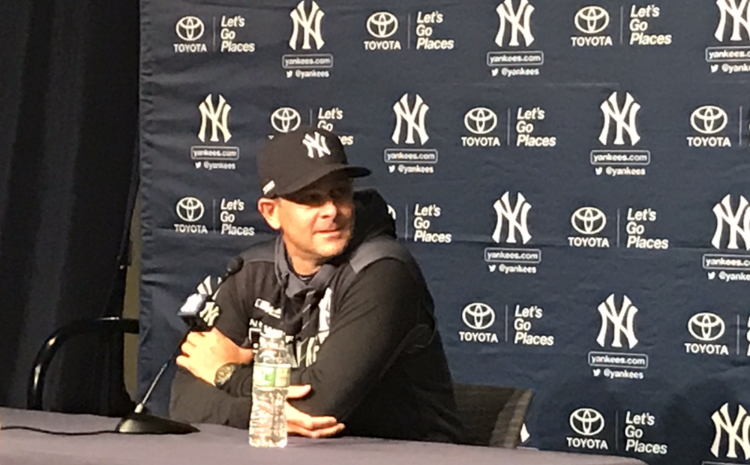 "Happy New Year's Eve" is how Yankees Manager Aaron Boone greeted the media on Wednesday afternoon at Yankee Stadium as the team worked out ahead of Opening Day. 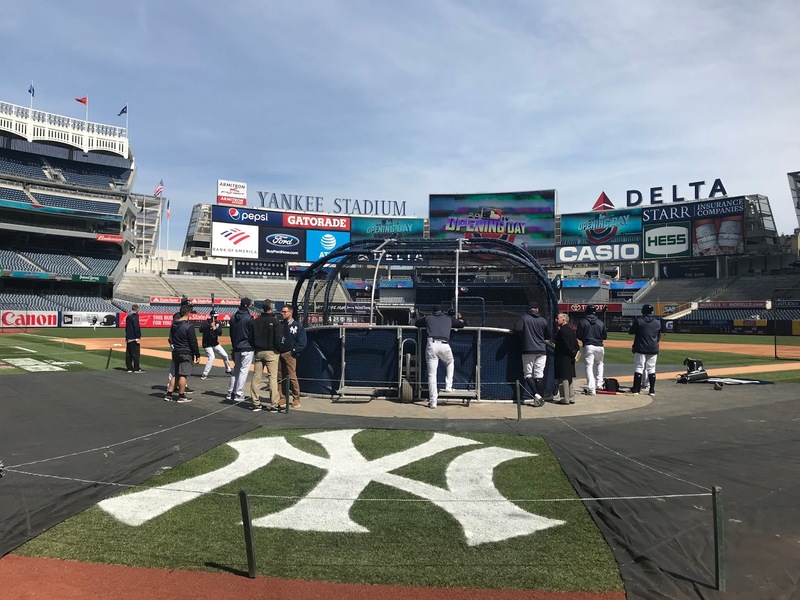 The Yankees will open the season against the Baltimore Orioles on Thursday at 1:00 p.m.
Boone said of what makes Opening Day special, "I love the day. It's filled with the butterflies, with the excitement. 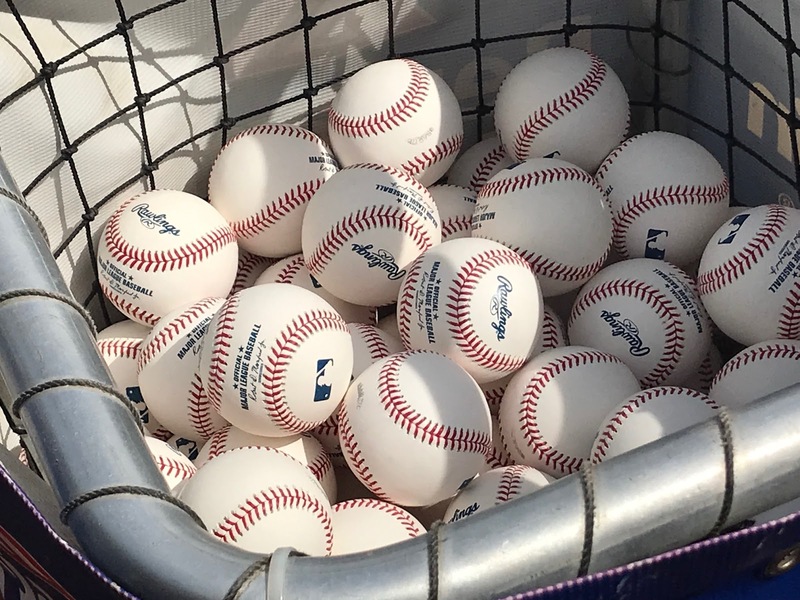 I think back to my days as a little leaguer. 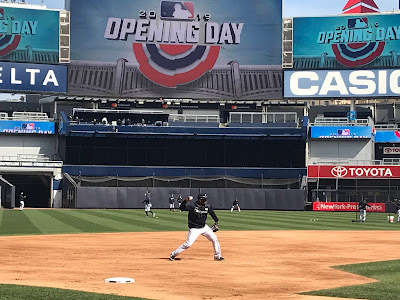 I remember waking up as an 11-year-old, getting ready for little league and it got rained out, and I was like, 'there's just no way they were gonna take this day away from me,' and it got rained out. I was just crushed. 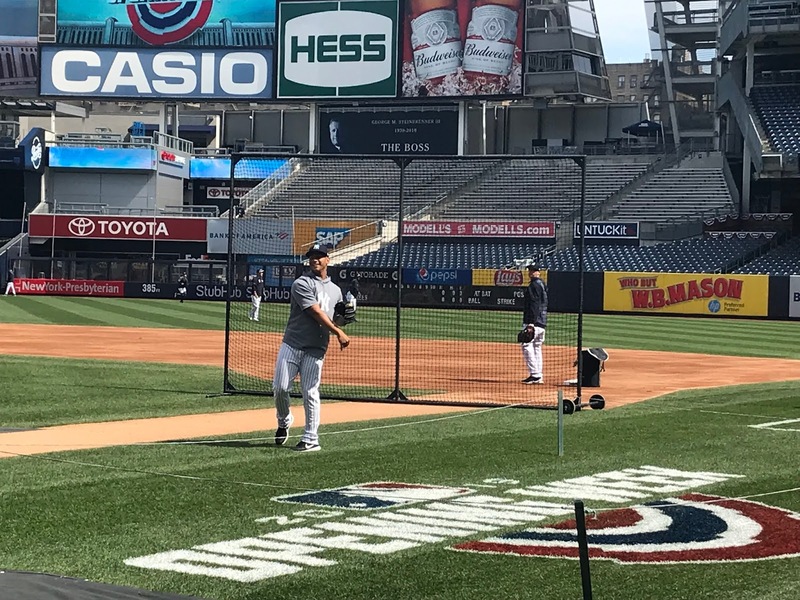 "It's always to me been a celebration of our game. 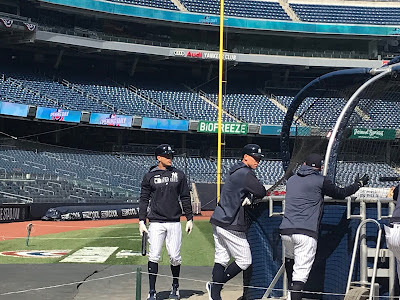 It's a big deal to be able to walk out there and put on a Major League uniform, but certainly the pinstripes, I don't take it lightly. I don't ever want our guys to. 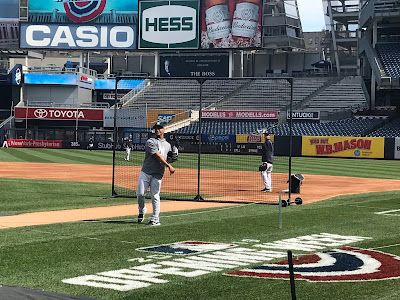 It's a privilege to go out there and compete against the best in the game. 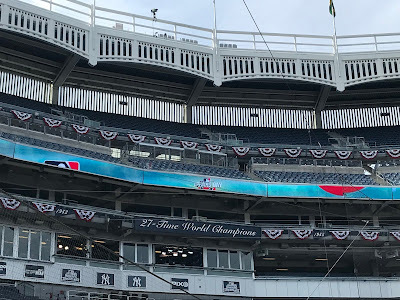 It's a day filled with all kinds of emotions and excitement, and I think, ultimately, a celebration of our sport." 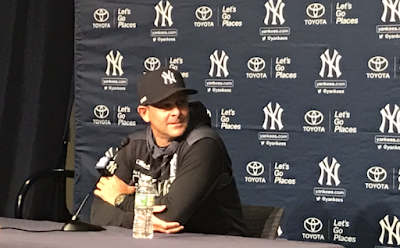 Aaron Boone on Wednesday afternoon. Boone announced his lineup, saying, "I'll just let you know who's playing. 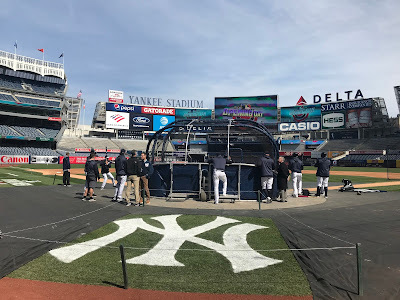 Gary (Sanchez) behind the plate, (Greg) Bird at first, (Luke) Voit DH, Gleyber (Torres) at second, Tulo (Troy Tulowitzki) at short, Miggy (Miguel Andujar) at third, (Giancarlo) Stanton left, Gardy (Brett Garnder) center, and I think we're gonna go with Judgie (Aaron Judge) in right." 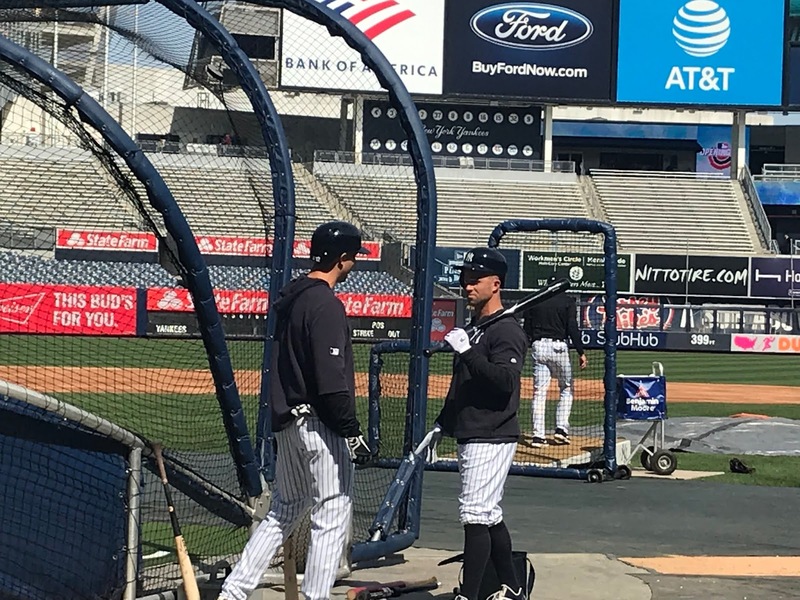 On what went into the decision to put Bird into the field and Voit at designated hitter, Boone said, "Honestly, not a whole lot, kind of envisioned Voit playing first in game two. 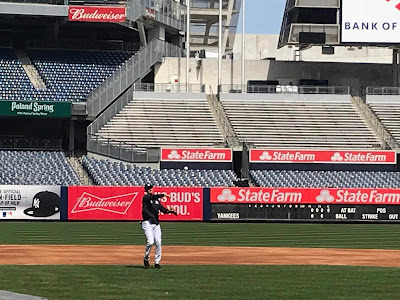 With DJ (LeMahieu) on the bench, gives me a little more flexibility to move him into a situation where I can keep him on the field is all, in case there's a lefty scenario in a spot we like." 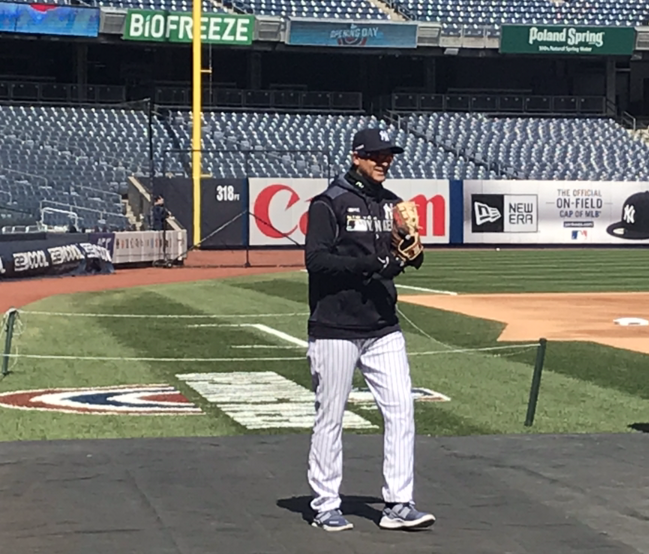 Masahiro Tanaka will be the Yankees' Opening Say starter, the fourth time he has had the honor since he came to New York in 2014. That is the most by any Japan-born pitcher in Major League history. 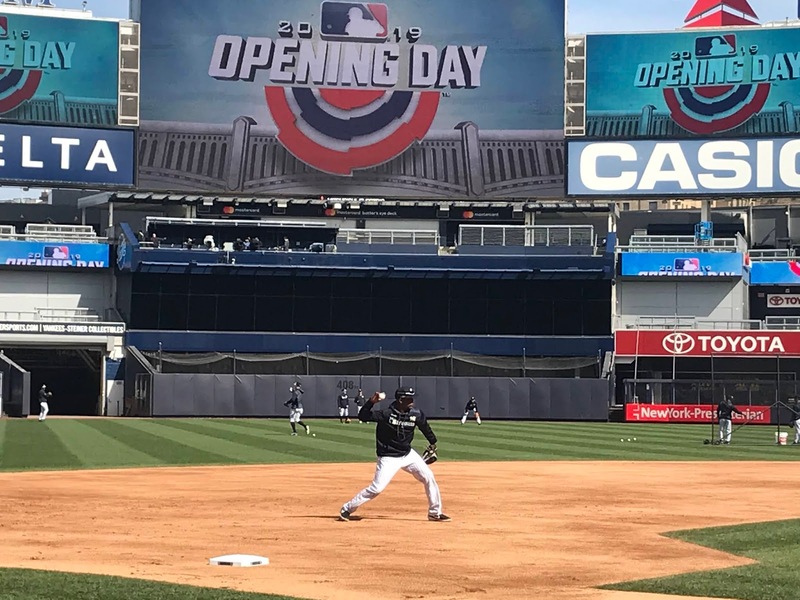 He started the openers three straight years, 2015 to '17, but is still looking for his first victory. Mel Stottlemyre, Ron Guidry, and Whitey Ford have made the most Opening Day starts in Yankees history, with each getting the ball seven times to open the season. 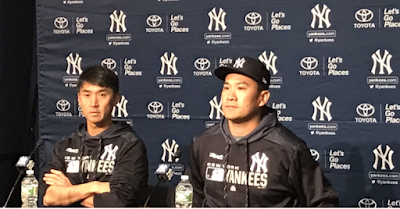 Tanaka said (through a translator) of starting the opener, "Definitely the nerves, the tension is getting higher, I guess. You can just tell by how many people are here in this room, a lot of eyes on this game. 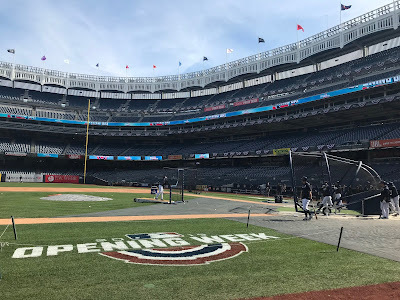 I'm looking forward to it, but how I spend the next 24 hours, I'll just take it as a normal regular season game, not do something out of the norm." 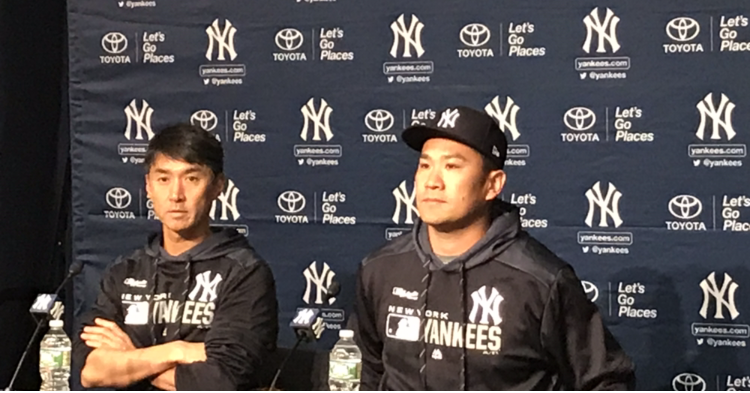 Masahiro Tanaka (right) is ready to go. The Yankees won 100 games last season, won the Wild Card game against Oakland, and lost in the Division Series to Boston, the eventual World Champion. In 2017, the Yankees came within one win of the World Series. Boone said of what he thinks of his team heading into his second season at the helm, "I believe wholeheartedly in our group, not only in their talent, but all that they've gone through as well, and you know, where they are from a frame-of-mind standpoint. 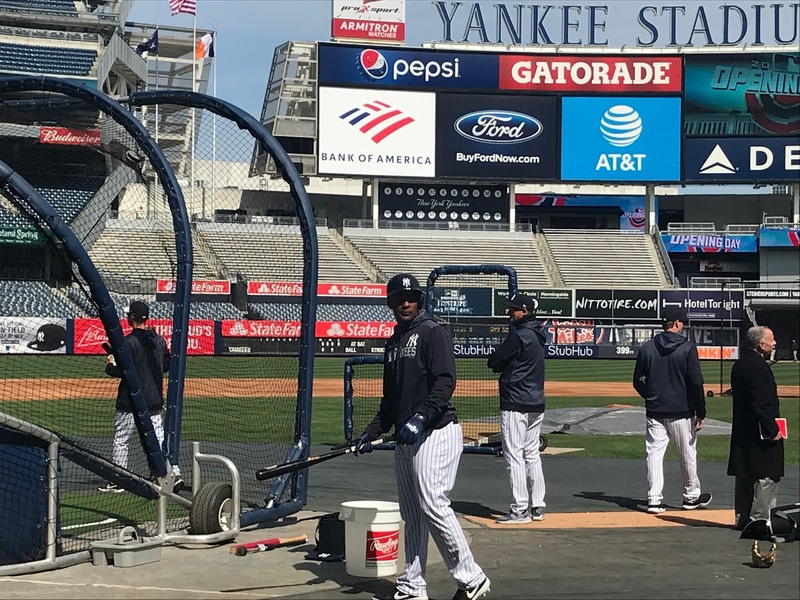 This is a hungry team, and you sense that in being around them, and I feel like they're in a really good place. 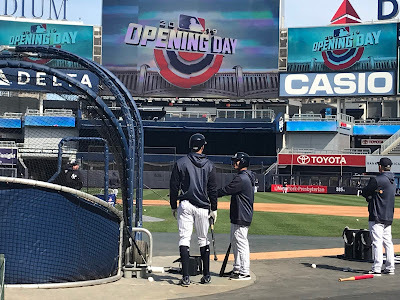 You know, the one thing I guess I think about a little bit is just, especially early in the season because that's all we have to go on, so the first days, first week of the season, we all kind of tend to overreact to everything and how a guy's doing, so you like to see guys get 'first' things out of the way, you know, whether it's a hit, whether it's an extra-base hit, you know, getting into the flow of the season early on, dealing with some cold weather and stuff. 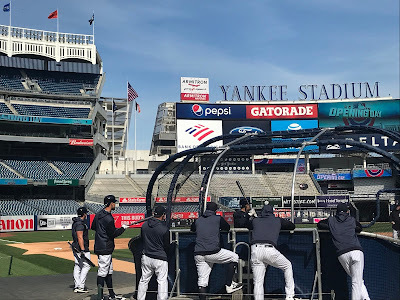 Just seeing guys be able to quickly as possible kind of get into their normal routine of the season and then their talent usually takes over from there." 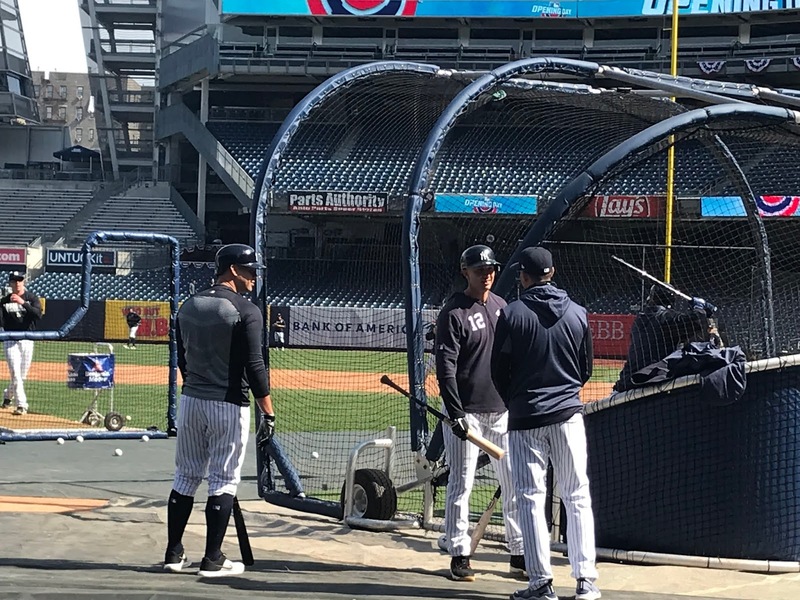 Giancarlo Stanton passes by Aaron Judge and Aaron Boone at the cage. 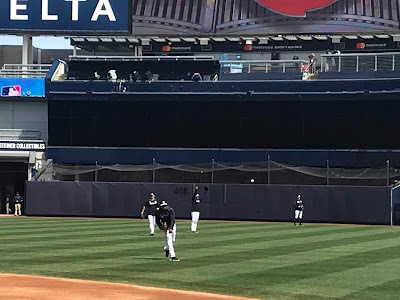 "Just playing at Yankee Stadium, the history here and the ones who wore these pinstripes before us and for all of us who get an opportunity to do that same thing. It's just a special moment. Very few people get to play here and witness this, and just being a part of all this, especially with the team we have, the position we're in, it's exciting times here in New York." 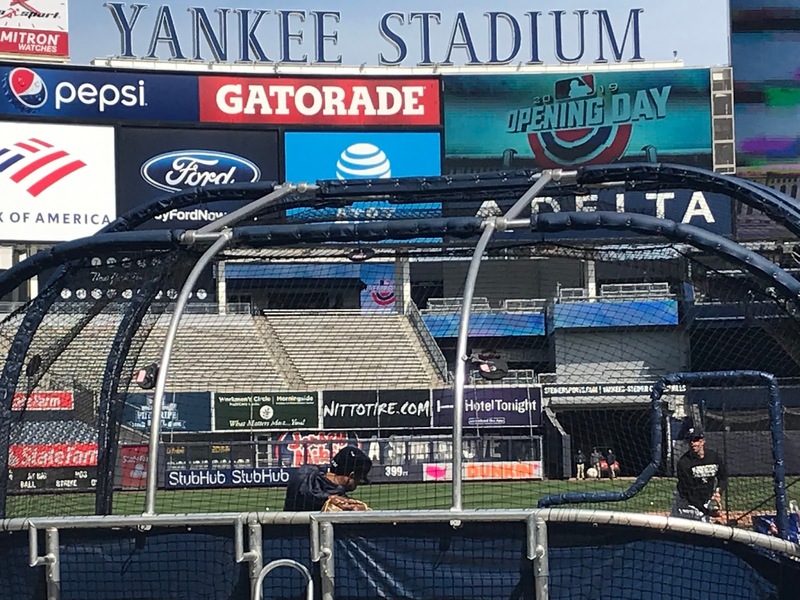 Gary Sanchez taking some cuts in the batting cage. Aaron Boone had a glove on, ready to take the field. 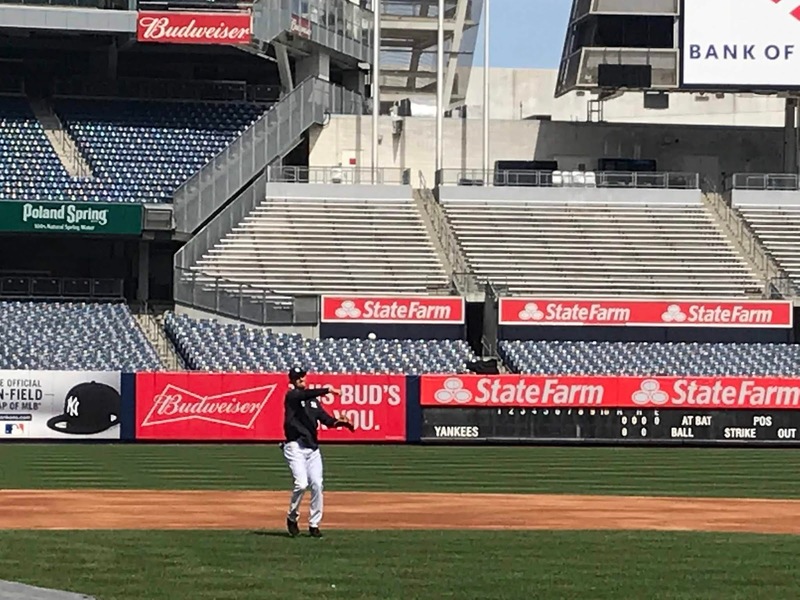 Troy Tulowitzki making a throw at short stop. 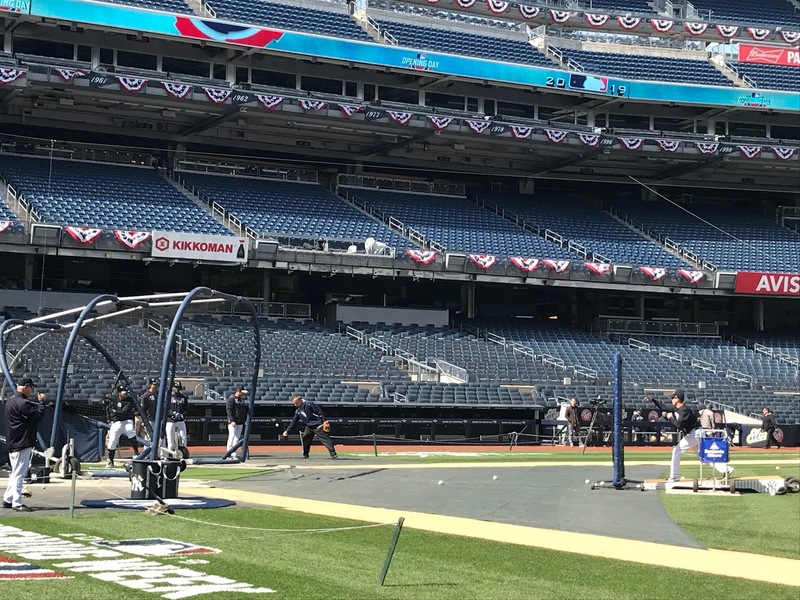 The bunting around Yankee Stadium is an Opening Day tradition. 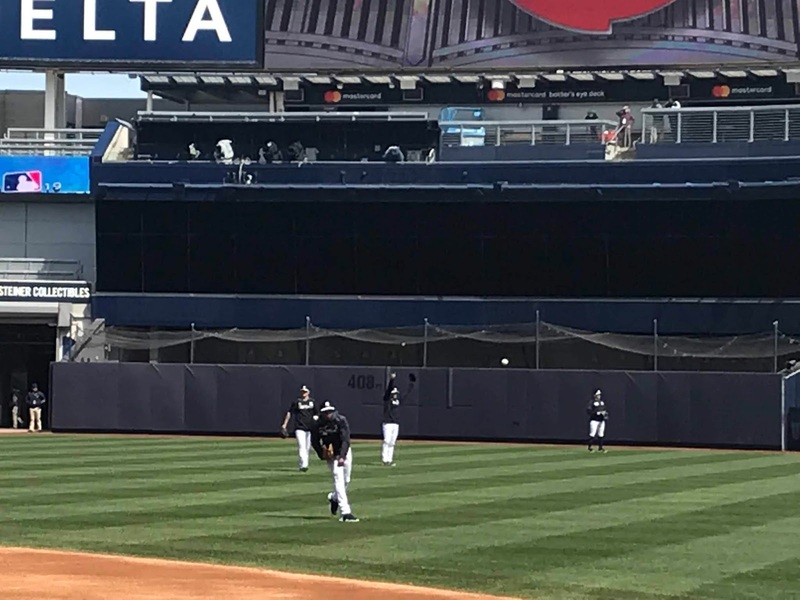 Yankees closer Aroldis Chapman lets one fly (look for the ball). Boone giving Miguel Andujar some pointers. Andujar looking towards the dugout. 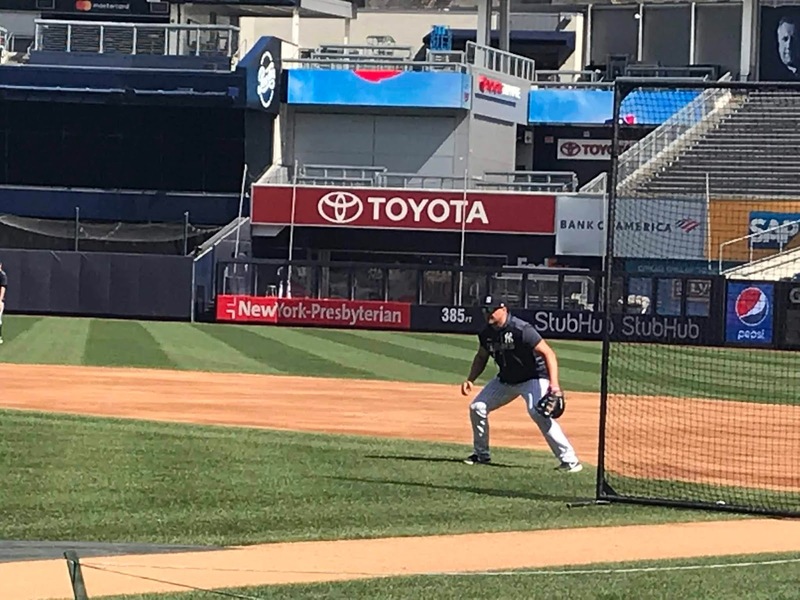 Luke Voit working out at first base. Tulowitzki (left) chatting with Brett Gardner. 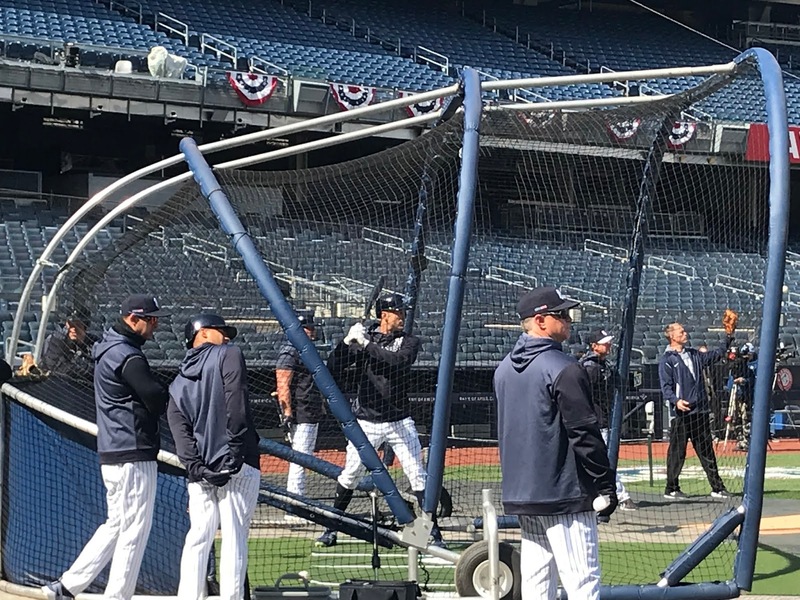 Gary Sanchez takes a cut in the cage. 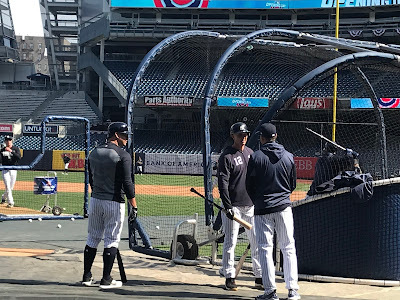 Sanchez (l.), Tulowitzki, and Boone chatting. 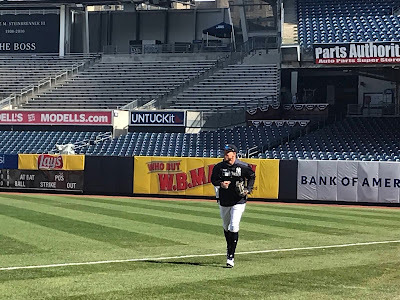 Aaron Judge running in from right field and his Judge's Chambers. 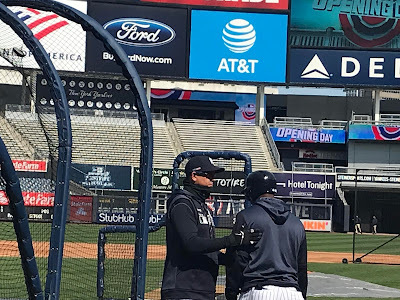 Giancarlo Stanton chats with Gleyber Torres. Stanton hitting with Voit (l.) and Judge (2nd from l.) looking on. Andujar making a play at the hot corner, third base.